The GigaCasterII is ENENSYS bidirectional TS over IP gateway that provides a versatile, efficient and reliable solution for delivering digital TV content over IP networks. GigaCaster II is high density TS over IP gateway that can handle the carriage of up to 8 MPEG-2 Transport Streams (MPEG-2 TS) in ASI to IP direction or in IP to ASI direction. Each MPEG-2 TS can include either MPEG-2, MPEG-4 (H.264), HEVC (H.265) video content in SD, HD or UHD format. The GigaCaster II is the most efficient TSoIP Gateway to cope with all IP network drawbacks: removing IP network jittering, recovering IP packet loss using FEC ProMPEG CoP#3, substituting bursty packet loss with NULL packets while maintaining an accurate and constant output bit rate and re-ordering IP datagrams. When broadcasting over Single Frequency Network, the GigaCaster II implements a patented technology that guarantees a reliable SFN broadcasting with or without external 10MHz reference. 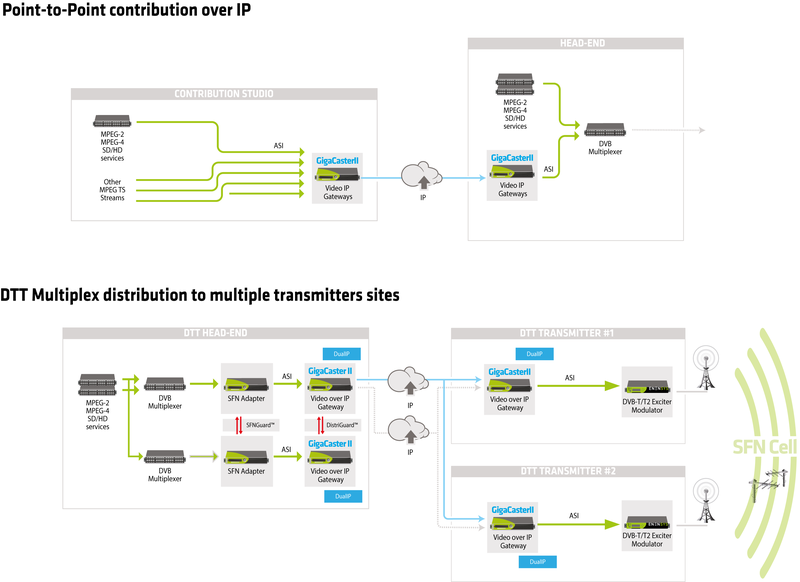 It offers various redundancy mechanisms at unit level (DistriGuard) and stream level (Dual IP) to ensure a safe IP delivery. The Gigacaster II can be configured as an ASI to IP or IP to ASI converter. Supporting ATSC, DVB, and ISDB-T standards, it can be deployed in multiple broadcast environment where it is required to connect legacy equipment to IP networks. 44 mm / 1.7 in.